Mammals - Animal Wonders Inc.
Mammals bring joy to millions of people around the world. Domestic cats and dogs live in many homes. Many more homes have horses, goats, hamsters, rabbits, rats, and/or guinea pigs. Animal Wonders gives a home to displaced wildlife and other exotic mammals. Whether they were born in captivity or for some reason or another came from the wild and can no longer return, Animal Wonders provides them with a life-long home. Click on their picture to see their biography. Prehensile-tailed Porcupine (Coendou prehensilis). These amazing porcupines live in and around the Amazon rainforest of South America. They are unique for a porcupine because of their smaller size and long, quill-less prehensile tail. A "prehensile tail" means that they can use their tail to hold onto branches like a 5th hand. It is so strong that they can hang upside down from just their tail! This comes in very handy because they are arboreal, which means they live up in the trees for their whole lives. Porcupines are rodents, which means they have 2 very large front teeth. 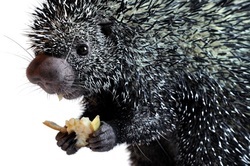 Prehensile-tailed Porcupines eat leaves, twigs, roots, fruit, and flowers. They use their hands to hold their food while they munch on it with their big front teeth. In the wild, Prehensile-tailed Porcupines are shy, but they defend themselves quite well with their quills. Unlike popular myth, porcupines cannot shoot their quills. The quills are modified hairs that are barbed. When another animal gets too close, the porcupine will jump toward it and the quills come loose from the porcupine, leaving the quills in the intruder's skin. Predators and other curious animals learn quickly not to mess with a porcupine no matter how small. Arctic Fox (Vulpes lagopus). Arctic foxes are one of those amazing animals you can only catch glimpses of on a nature channel on TV. They are mysterious, elusive, and beautiful. These unique foxes are relatively small but have very long dense fur that makes them look large and fluffy. They use their thick fur to keep warm in the cold snow and ice of the extreme north where they call home. During the summer months the thick white fur is too hot and they will shed it out completely leaving behind a short, dark brown and gray coat. Arctic foxes are in need of our help! Their habitat is shrinking due to human encroachment, climate change, and also species competition. Since climate change has reduced the frigid weather in the Arctic, the red fox is able to go further and further into the Arctic fox's territory because don't need an extra thick fur coat to survive. 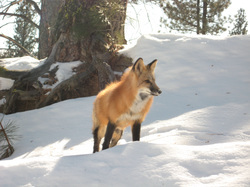 The red fox is larger and is able to out compete the Arctic fox for food and shelter. Several populations of Arctic Foxes are now endangered. Please help spread the word about the plight of these truly amazing animals. Red Fox (Vulpes vulpes). Foxes are the smallest canines in the dog family. The red fox is the largest of the foxes and can weigh over 20 pounds and can run 30 mph! When they are still young, red fox kits are brown so they blend in with their environment and can hide from predators. As they get older their fur turns orange. The females are called vixens and the males are simply called foxes. Red foxes are native to Eurasia and North America, but have spread to many other countries as well. They are omnivores and like to eat small mammals, birds, reptiles, and insects and also like fruit and vegetables. Foxes are the most cat-like canines and many are accomplished climbers. Patagonian Cavy (Dolichotis patagonum). These interesting animals live in southern Argentina in South America. They roam grasslands eating mostly grasses and shrubs. They are rodents, closely related to capybaras, guinea pigs, and chinchillas. They have large front teeth which are ever-growing, meaning they will continue to grow their entire life and need to chew, chew, chew. 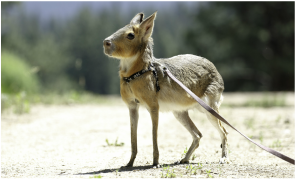 Patagonian cavies are interesting animals because they look like a mixture between a deer and a rabbit. They have long legs and can run very fast. They live in groups and have their babies in burrows. Unlike most rodents the babies are born with all their fur and their eyes and ears are open. Patagonian cavies make many sounds and are similar to the sounds a guinea pig makes. North American Beaver (Castor canadensis). Beavers are well known for their unique tail and incredible chewing abilities. Coming in at second largest rodent in the world, beavers have ever growing teeth that allow them to chew through entire trees to create the perfect habitat for them and their young. Beavers mate for life and raise their babies for 2 years until they are mature enough to make a lodge and find a mate of their own. Beavers use their tail to swim, send warnings to their family, and as a fat storage to help them survive the long cold winters. Beavers are semi aquatic and their double coated fur keeps their bodies warm and dry. African Crested Porcupine (Hystrix cristata). Info coming soon. *Kizmit can only attend assemblies or events with a stage or large open space. Striped Skunk (Mephitis mephitis). The striking color is well known among humans and animals. 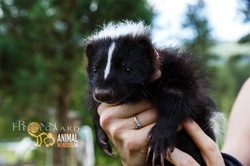 Skunks display their warning loud and clear with their black body and white stripes. These amazing little mammals are found in the Canada, North America, and parts of Mexico. They are mostly nocturnal and their favorite thing to do is eat. Skunks are solitary and have one agenda in mind, find as much food as they can and eat it as fast as possible. If you don't heed their warning colors you are in for a smelly consequence. Skunks are named for their powerful defensive spray that can reach up to 15 feet! Their scientific name, Mephitis mephitis, means "stinks stinks". Southern Three-Banded Armadillo (Tolypeutes matacus). These unique armadillos are one of only two species that can roll completely into a ball. Their armor allows them a quick defense against predators. They are found in south central South America in arid regions. Their diet is composed of mostly insects, specializing in termites. They use their large strong claws to dig into termite mounds and lick up as many termites as they can. Brush-tailed Bettong or Woylie (Bettongia penicillata). These small amazing animals are found in the forests and grasslands of Australia. They are related to kangaroos but only stand about a foot high. At one point these bettongs lived across most of Australia. In the 1970's brush-tailed bettongs were put on the Endangered Species List. Foxes nearly hunted them to extinction. They made a huge comeback and became Australia's first mammal to be removed from the Endangered Species List in the early 1990s. Unfortunately, in the last 10 years brush-tailed bettong populations plummeted to over 80% losses and they are now considered Critically Endangered on the IUCN Red List (see their status here). Many efforts are being made to bring their populations in the wild back up adequate numbers. If you would like to learn more about brush-tailed bettong projects please visit the following link. Woylie Conservation Research. Black Tufted Marmoset (Callithrix penicillata). Info coming soon. *Mimi is still in training. She's not ready to meet the public just yet. Chinchilla (Chinchilla lanigera). These rodents come from the Andes Mountains in South America. The high altitude make it very cold to live there so Chinchillas wear a very special coat of fur. Most mammals, including humans, have one hair per follicle. Chinchillas have about 80 hairs per follicle! That's what makes their fur coat so warm and it also make it extremely soft. Chinchillas like to stay clean and will groom themselves sparingly with their tongue, but because their fur is so thick if they were to get too wet they wouldn't dry out for a long time. To get clean chinchillas take a bath in volcanic ash, which is very fine dust. Unlike other rodents, chinchillas have fur on their toes. They also have long and strong back legs to they can jump about 4 feet in the air! African Pygmy Hedgehog or Domestic Hedgehog (Atelerix albiventris). Hedgehogs have spines that cover their entire back and top of their head. When they are frightened they curl up completely covering their belly, head, and legs. This is how they protect themselves from a predator that wants to eat them for lunch. They are not related to porcupines but do resemble them because of their spines. Hedgehogs are mostly nocturnal but can be awake some times during the day. They are insectivores, meaning they eat insects but they will also eat other foods they come across like frogs, snakes, berries or mushrooms. One neat behavior they have is when they come across a new smell they will froth at the mouth and then lick their back depositing the froth onto their quills. It is not know as to why they do this. Sugar Glider (Peteaurua breviceps). These marsupials live in Australia where they eat nectar, fruits, and insects from the trees they live in. If they decide they want to move to another tree they leap into the air and spread out all four legs, creating a parachute of skin, and glide to the chosen destination. They have skin that attaches to their wrists and ankles. You barely notice it when they aren't gliding through the air. Sugar gliders are nocturnal, which means they are awake at night and sleep during they day. Because they are awake at night they need extra large eyes to see in the dark. They specialize in catching insects and finding the sweetest fruits and nectars. Guinea Pig (Cavia porcellus). These lovable little rodents originated from the Andes Mountains in South America. They are very common as pets and have been bred for different colors, coats, and sizes. There are even hairless guinea pigs, called skinny pigs! Aside from their popularity as a pet, guinea pigs are true rodents with 4 large ever-growing teeth; 2 on the top and 2 on the bottom. Guinea pigs have keen hearing, sense of smell, and eyesight. Since they don't have any form of defense besides their super senses, they rely on their instincts to make sure they evade predators. 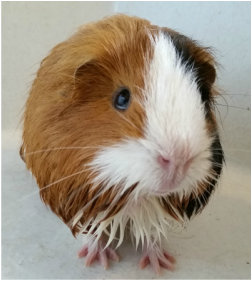 Guinea pigs will startle and hid whenever the hear a loud noise, smell a scary smell, or see a quick movement. It is their quick response to these events that will end up saving their life. Netherland Dwarf Rabbit (Oryctolagus cuniculus). These rabbits are originally from the Netherlands and they are much smaller than most rabbits. They are very popular as pets because they are so small and look like babies even when they become adults. Rabbits are interesting animals because of several unknown characteristics. Rabbits are not rodents, instead of two large front teeth on top and bottom they have four. Two directly behind the first two. Also they don't have any pads on their feet, instead they have a bunch of fur. Rabbits use their large ears to not only hear very well, but to keep cool on hot days. They put their ears up and let the breeze flow against them, which cools the blood and and then cools their entire body. There are many more interesting things about rabbits, try to learn all you can.